Titian's Sacred and Profane Love: Sacred and Profane Love: Presepio, Nativity, Night (Una Nocte) & Alchemic Night. Sacred and Profane Love: Presepio, Nativity, Night (Una Nocte) & Alchemic Night. Queens it and Brides it unto me. One way to read the Sacred and Profane Love is as a rigidly constructed Alchemic Night, which is an Alchemic narrative based upon the Nigredo and the ancient notion of Night as the engenderer. Historically this will involve that great female art patron of the Renaissance, Isabella d’Este and her quest to acquire a painting from the studio of Giorgione; a 'Night' (una nocte), after Giorgione's untimely death from the plague in 1510. Being mindful of the complexity of the Alchemic tradition and the Alchemic implications that contribute to the Sacred and Profane Love, an imaginative historical environment is required to populate all possible relationships surrounding Isabella and the Sacred and Profane Love and in particular those references that might refer to the Sacred and Profane Love as a presepio, una nocte, Night, and/or nativity. To set the wheels of inquiry in motion, a series of events were taking shape late in the Quattrocentro which would produce revelatory documented communication between Isabella d'Este and Giovanni Bellini some seven or so years preceding those agitated tribunals involving Titian, Bellini and the Council of Ten in 1512. Through a letter from Bembo to Isabella, Bembo writes that he has almost secured Bellini’s interest in producing Isabella’s commission if only she could write directly to Bellini. On the 19th of October Isabella did so, and curiously, for the second time, refers to the painting as a ‘presepio’. Fig 1. Domenico Ghirlandaio, The Adoration of the Shepherds,1485. '…In the ancient word, a combination of prae, "in front," and saepire, "to enclose,"... Ibid. The design of the Sacred and Profane Love mimics the structure of a presepio because the centrally placed sarcophagus alludes to the motif of an enclosed manger and subsequently, a nativity. Visually the Sacred and Profane Love participates in the category of a pagan nativity, and there is nothing here that might credibly indicate otherwise. Isabella's programme not pursued by Bellini. 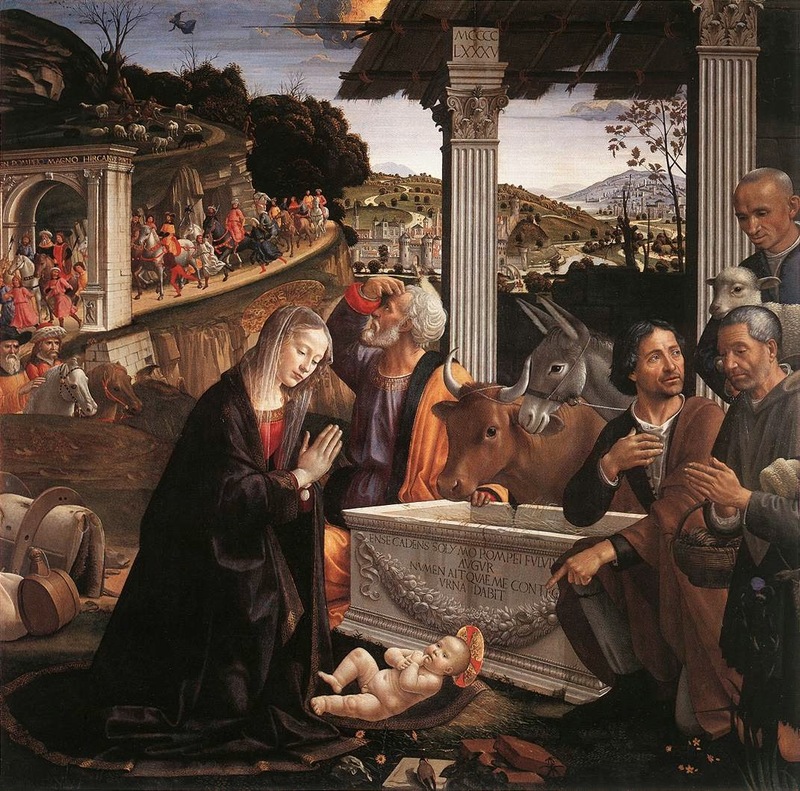 "In fact, Bellini was able to beat her down even further; she ended by accepting a Nativity." The disappearance of the una nocte, Isabella's haste, Bellini and Alfonso. Alternatively, the Night in Giorgione's studio may have been derived from the original programme, the importance of which Isabella was not aware, though this seems unlikely as Bellini was approached by Alfonso while Isabella was still in negotiation with Bellini. Obviously Bellini had prioritised Alfonso. Giorgione pursued the Sacred and Profane Love as an uncommissioned piece for two reasons: Firstly, had Giorgione chosen to pursue the commission it would not compromise Bellini's position as Painter to the Republic of Venice. Secondly, Giorgione had an interest in esoteria. This will be discussed in the Fondaco post. Upon arriving at Giorgione's studio, Isabella's agent was informed that there were two paintings that fitted the description, one owned by Taddeo Contarini, and the other by a Victor Beccaro, but added that they were 'not for sale at any price'. Was this a simple deception organised to 'throw the dogs of the scent' as it were? Alfonso d'Este, The Council of Ten & Nicolo Aurelio. Of the several reasons behind the resentment toward Alfonso was that he had joined the League of Cambrai in the war against Venice and in 1510, assisted by the French, crushed the army of Venice in an ambush along the Po river, causing a loss to the Venetians of upward of 'three thousand men'. Life of Leo X. W. Roscoe p.241. If the Council of Ten had been informed of the existence of a painting for Alfonso, they would certainly not have allowed him that prize. Here would be the perfect leverage for Aurelio to negotiate and claim the painting for himself. This would be effected with Titian's complicity of course, for it would be he who would be required to authenticate the painting for Aurelio in the form of the coat~of~arms. As everything about this painting is pervaded by and has its source in Ferrara, the painting which became known to Isabella after Giorgione's death as the Night, may well have been the same painting requested by Alfonso and which is now come to be known as the Sacred and Profane Love. The Sacred and Profane Love is a Collaborative work. '...he thought that the artist should have been required to have submitted several sketches before having begun the painting. This would have allowed Isabella to have chosen from among them thereby correcting a certain imbalance by having the figures relatively small with regard to the overall pictorial field.' P.B. p.
If this were the Sacred and Profane Love at an earlier stage of resolution, Bellini would have been quietly pleased that his artifice had hidden the programme that had become so distasteful for himself to execute. Secondly, the balance of figures to landscape that was considered by da Pavia 'disproportionate' suggests an earlier working stage of the Sacred and Profane Love - because the Sacred and Profane Love does not participate in the popular use of ‘perspective’ or ‘optics’ as the method was then called. From this criticism da Pavia has possibly indicated a stage of the paintings resolution at the time of his recording that observation. There is every reason to consider the Sacred and Profane Love as a collaborative work. Bellini may have been responsible for the painting at an earlier stage of completion and this would account for the diminutive figures noticed by da Pavia. He would not have wished to continue because the painting embraced alchemic philosophy - which had been outlawed by the Venetian state. Giorgione was most likely to have been responsible for the larger figures of the women and child - the child being the key to that consideration. Titian had the third and final hand in the paintings construction, harmonising the paintings overall design, as though it were a poesie, and being far less critical and less challenged by an intellectual adherence to any programme. This collaborative proposition may best suggest the reason behind the enigma that is the Sacred and Profane Love, because Titian, by treating the work as being intellectually irrelevant - a mere poesie - the original intent was made all the more obscure. Finally, the una nocte/presepio/Sacred and Profane Love was removed from the workshop of Giorgione of which Titian had complete access. Although the Night was not directly removed by Titian who was in Mantua at the time of Giorgione's death, taking this tack implies a political involvement because anything to do with Aurelio and this aquisition should be seen as political. If, as is being proposed here, the Sacred and Profane Love and the presepio/una nocte are one and the same painting, it may not be too difficult to find Giorgione’s hand, after all, the Sacred and Profane Love has been considered to be Titian at his most Giorgionesque. While Alfonso's well no longer exists the idea of the Night also being the presepio adds to the allegoric levels of content of the Sacred and Profane Love because of the unusual stone sarcophagus/well/manger motif. Why, of all things, would Alfonso ask Titian to sketch a well, unless of course, Alfonso was hoping to detect a certain level of discomfort... It would be below a man of Alfonso's standing to engage a paid worker - Titian - in an accusative manner, or even show an agitation toward him, and yet by sending Titian to this well, to have him sketch it sends direct a message to the seat of any possible guilt. It would be the aristocratic manner befitting Alfonso to rise above the engagement of direct accusation yet still having expressed his attitude. The Sacred and Profane Love as an allegory with several levels now encompasses three more metaphors: Presepio, Nativity and Night. To reiterate a point from an earlier post; the Sacred and Profane Love is dedicated to Venus and the time of day represented by the sun-streaked sky is twilight, the time of day when the planet Venus first appears to the naked eye. Therefore the Sacred and Profane Love qualifies in its own right as a nocturne which is also and quite literally a Night; but it is most definitely a Pagan Night. 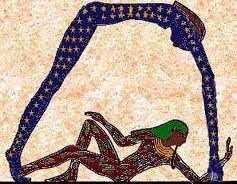 Night belongs to the Goddess lineage of the Egyptian Nut, whereas Nox is the etymological source of equinox, meaning (day) of equal night. As Nox was one of the oldest of the Roman gods, there is a sense of Egypto/Hermetic recovery here, which is the essence of the Renaissance zeitgeist. On several levels, the Sacred and Profane Love was intended for Alfonso d'Este, but without documented evidence, we can never be certain - because we weren't there. This area of conjecture, this construction of a history, while interesting - makes absolutely no difference to the content of the Sacred and Profane Love, but to be sure, all considerations presented here are presented with an understanding of the meta-narrative and all associated implications. From where did the Sacred and Profane Love originate? Again, we weren't there, nor is any evidence thus far, although there is an argument forthcoming that will confirm Ferrara, and so, Alfonso d'Este. ...to be continued next post. Also - The restoration of the Sacred and Profane Love; the Aurelio coat~of~arms; and rethinking the Fondaco murals, and the link between the Fondaco murals and the Sacred and Profane Love. ** An acknowledgement is due here to Dr Frank over at Giorgione et al for his thoughts on the presepio as a manger. Thank you Dr Frank, I hope you feel this revision better articulates the difference. *** At the recent suggestion of Dr Frank this section has been revised to include Isabella's letter accepting a standard Nativity. Thanks again to Frank for his helpful observations. Bourke, P. 1974. Tradition and Innovation in Renaissance Italy. Fontana/Collins, London. Williams, J. 1968. The World of Titian. Time-Life, Amsterdam. Roscoe, William.1853. The Life and Pontificate of Leo the Tenth. Henry G. Bohn, London.